With the capital punishment law repealed in 1907, the Kansas Legislature made several unsuccessful attempts at reinstatement in 1927, 1931, and 1933. In 1935, the legislature succeeded in reinstating the death penalty with House Bill 10. 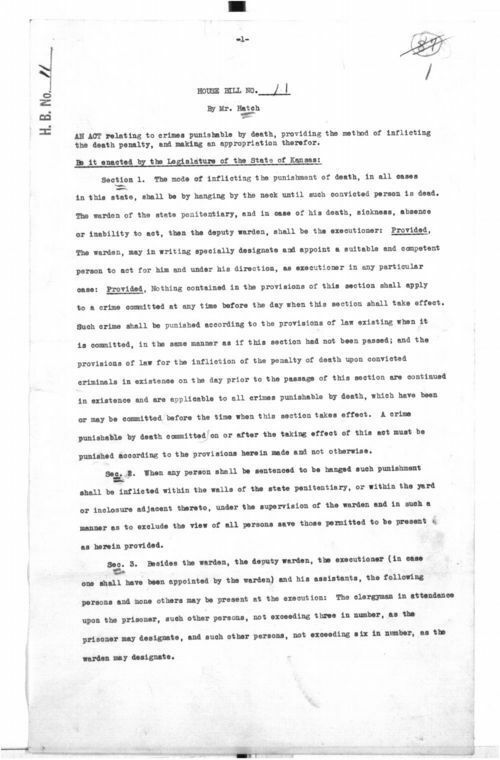 A companion bill, House Bill 11 (1935), prescribed hanging as the method for inflicting the death penalty in all cases. The bill also provided for the executioner, the time and place of execution, and cases of insanity, pregnancy, and escape. Although Kansas abolished the death penalty in 1907, no executions by state authority had occurred since 1870.